In the late 1970s I was working in Montreal in a small 1960s tower still standing at 1080 Beaver Hall Hill. The street name harks back to Canada’s fur-trading days. Across the street was a typical Montreal tavern, I can’t recall the name now. It served draft and bottled beer and the tavern food of the era, some of which is still served in Montreal. This tavern was a large room with small round tables and wooden, round-backed “bankers” chairs. The food included hamburger steak, french fries, french fries and gravy (no cheese, this was before poutine), spaghetti, pizza, and “farmer” sausage. There might also be tourtière and other French-Canadian foods, pig’s feet and meat balls in brown sauce, say. There were also small steaks, sandwiches including a club sandwich, and sometimes chicken or meat croquettes. (Croquettes seem to have disappeared from menus everywhere which is a wrong some retro-minded chef should correct soon). I remember one waiter there, I think he co-owned the tavern. He was medium-height, slim, of calm disposition, with a pencil moustache. He was clad in a black, tuxedo-type outfit, the uniform of the Montreal tavern waiter then. You see similar dress in illustrations of English Victorian restaurants. Most waiters in Montreal by then were francophone but he was “English”. Nonetheless he spoke perfect French, which was unusual at the time for an “Anglais“. I think he told me he had been a policeman in an earlier career. He was probably 45 at most and could still be living. Like all good waiters he would linger with the clientele to have a chat but was Johnny on the spot when the place was busy. Beaver Hall Hill is south of what used to be called Dorchester Boulevard, it is now boul. René Lévesque, after the late separatist premier of Quebec. On the other side of Dorchester was and is Phillips Square, originally a high-end shopping enclave which served the gentry and merchant classes who resided nearby. You see the Square pictured in the early image above. That’s King Edward VII in the centre and he is still there. In 1901, a Mr. Krausmann opened a restaurant on the Square’s east side, it was just outside camera range in that image, where the awning is on the right. The idea was a European cafe with mixed German and French influences which may explain the formal name, the Lorraine Café. 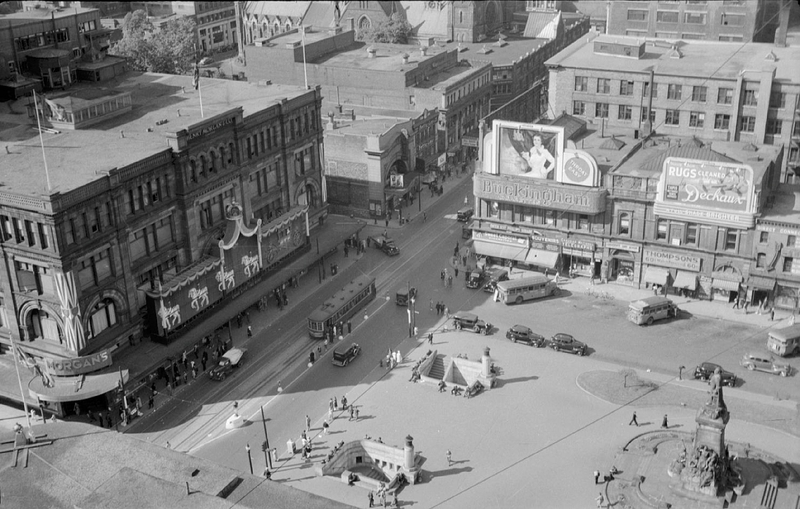 By the 1920s and through the second war, Krausmann’s Lorraine Cafe was a noted club venue which specialized in the dinner-and-show, a concept then prevalent in North America. In the 1970s, I sometimes went to Krausmann’s too, by then it was simply called Krausmann Tavern. I hadn’t known of the 75 year history and glory days as a supper club, it was just a good tavern with a slightly different menu. 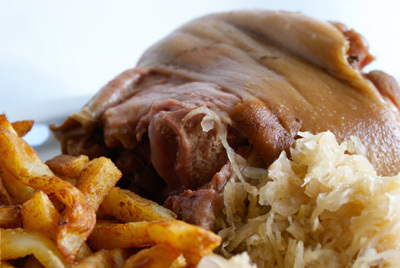 The star German dish, maybe the only Teutonic specialty by then, was the pickled pork knuckles. Perhaps it was from Lorraine, France, as Mr. Krausmann may have been. (In fact, I once had a similar dish in Stenay, an old garrison town in Lorraine). The shanks were brined and spiced, long boiled, and served with plain boiled potato and sauerkraut. 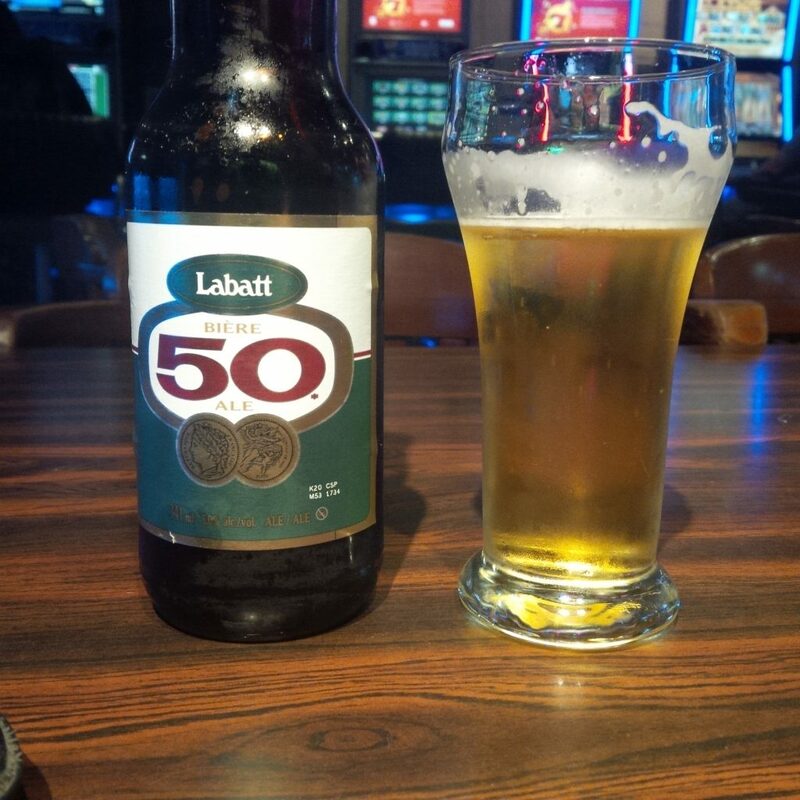 It was very good and the beer of the time, similar to the light but tasty Labatt 50 still sold, suited it. I left Montreal in 1983. A few years later, Krausmann’s moved from the north side of Dorchester to the south side, taking occupancy in the tavern of the ex-policeman. I never visited that location but knew of the change. In about 1990, Krausmann’s became Brisket, a restaurant which specializes in Montreal’s famous “smoked meat”, or cured and sliced beef piled high on a sandwich. It’s the Montreal version of the pastrami and corned beef in New York. Smoked meat has Montreal Jewish origins but like the bagel has departed its original precincts to become part of the general food scene. While pickled pork and smoked meat may seem from different universes, both are cured, carnivores’ specialties. In some ways Brisket was new, but in a certain way, it continued its older heritage. Yesterday, I was walking down from Phillips Square to Beaver Hall Hill to look at these old haunts and lo, the small Victorian block of buildings which housed the policeman’s tavern, the re-located Kraussman’s, and now Brisket still stands. Men were doing repairs in the doorway, and when I explained I had eaten there 40 years earlier, they kindly gave me a tour of the inside as it was closed until evening. It looked different than I remembered but the outside and inside have been modified numerous times since the 70s. Back then, small frosted glass panes typically formed the window casements of taverns, to prevent looking inside. This was common for Quebec taverns, and was probably required by law. While the main windows have changed, look at the sidewalk level: the old frosted glass is still there. The workmen introduced me to one of the principals, he was working in the kitchen. He was delighted to meet someone who had known Krausmann’s. Indeed the name is remembered in the restaurant’s current name, as Le Salon Krausmann is a sub-title of the Brisket name. Not just that, but he told me, rather improbably, that the famous pig’s knuckle dish is still served and follows the original recipe. 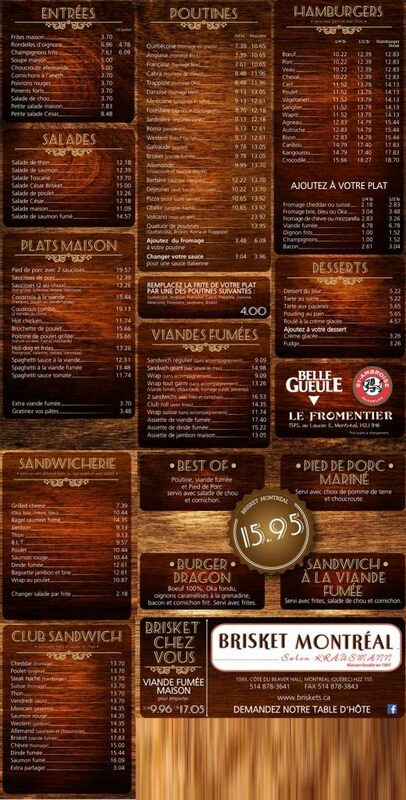 That menu (click twice for perfect readability) is a good example of how foods of various national origins can combine to form an area’s preferred eating: you see spaghetti, pig’s feet and meat balls, a Middle Eastern dish or two, hot chicken plate, lots of poutines, and an interesting range of hamburgers. Note the Trappist Poutine, I loved that one! It’s typical daily fare for Montrealers and Brisket offers pretty much the full gamut. I didn’t get the chance to eat there unfortunately but it is Stop No. 1 the next time I am in Montreal. Krausmann’s had to have that pig’s knuckle dish on its menu when it opened in 1901. It is now 2016, and the same dish is still served, a hop and skip from the original location. No one has explained this to the Montreal eating public as far as I know. I doubt there are many other if any dishes in Montreal or Canada for that matter served continuously for that long. You Montreal foodies investigating the new school of this and that – go to Brisket and try its historic pork knuckles: tell them to make it so it comes piping hot, you need to see the steam come out as you open it up. Forget french fries much less poutine with it, you want plain boiled potato and sauerkraut. And cold blonde lager, the house carries Belle Gueule and St-Ambroise beer, that will do just fine. Note re images: the first image above is in the public domain and was sourced from Wikipedia, here. The last two are from the website of Brisket’s in Montreal, here. ADDENDUM: SEE MY FOLLOWING TWO BLOG POSTS FOR CONSIDERABLE ADDITIONAL DETAIL ON KRAUSSMAN’S INCLUDING THAT THE FAMILY WERE FROM ELORA, ONTARIO. 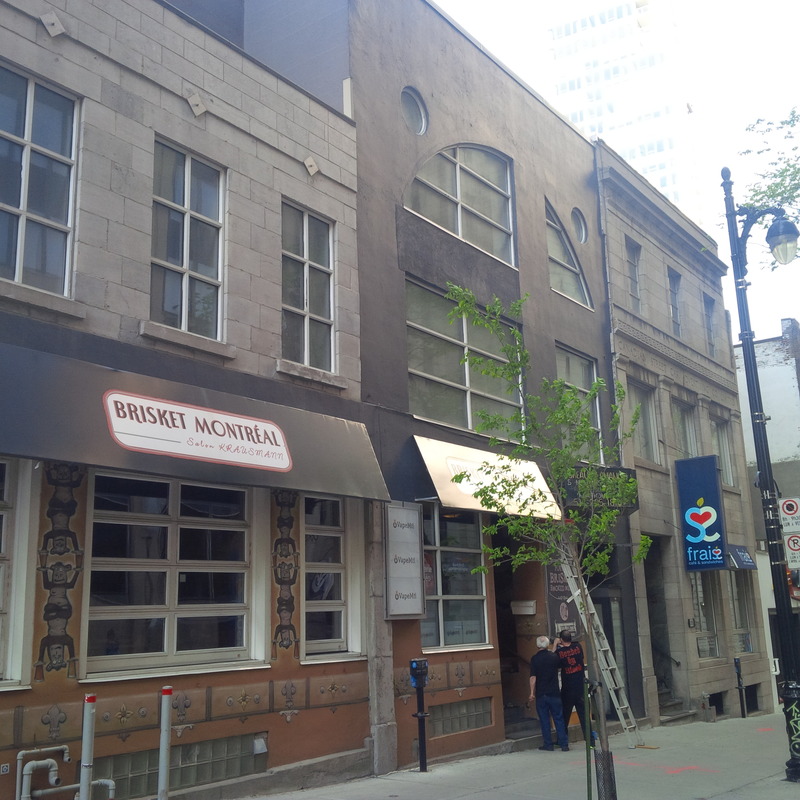 Note added by Gary Gillman April 1, 2018: On a recent visit to Montreal, I found sadly that the Beaver Hall Hill location of Brisket has closed. However, Brisket has two other outlets: a new one on boul. St-Laurent, and a pre-existing one in the Vieux Port district. And indeed the picked pork speciality is carried on their menus, so it still survives, after 117 years!